In your busy life you don’t have time to worry about your garage door. Thankfully, with proper maintenance, your door will last a very long time. However, no machine lasts forever. Eventually, the parts of your door opener wear out and break. Some of these parts are inexpensive to replace, such as the safety sensors that ensure the path of the door is clear before it closes. Other parts are more expensive, such as the motor. Whether your problem is large or small, the skilled technicians of Action Garage Door can quickly diagnose the issue and perform garage door repair in League City, TX. So very knowledgeable - very kind and business oriented - Will ask for this man if I ever need him again. Outstanding Service and very reasonable price. I was impressed by Luis T., the technician for Action Door. 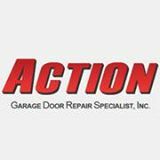 His knowledge and efficiency, his neat and thorough work, and his clear explanation of my options were outstanding, I would hope that if I need any future service from Action Door that Luis T. would be the tech who would do the work. Luis did an outstanding job and was completely prifessional. Apprexiate his promptness and courtesy. Knowledgeable worker. Fast service and reasonable price. Whether replacing parts, re-making an old door or installing new doors, the techs are considerate and professional. The latest call was re: a garage door opener. I thought the one I had was needing to be replaced. The problem was the sensor detector had become disconnected. I felt like an idiot but was told all was ok. In this day and age so many, of any age, are taking advantage of. But not this time. I highly recommend this company. After finding our garage door spring broken early Sunday morning, we called Action. They had a repairman out and it was fixed within two hours of our call. You can trust our technicians because we carefully screen our employees with background checks as well as skill requirements. We then provide them with further training to be sure that they are able to meet our strict standards for customer service and quality work. When our technicians show up at your home or business, they are prepared to properly diagnose the problem the first time. Your life is busy and you have better things to do with your time than schedule appointment after appointment with technicians who don’t know how to properly perform your garage door repair. Not all garage door opener problems require complete replacement of the system. Sometimes individual parts can be replaced or repaired. Our technicians are mindful of the fact that your money is not unlimited and they will discuss your options with you, suggesting quality fixes that are the least expensive. Yet, you can also be sure that we do not recommend temporary solutions that will shortly lead to problems. When we show up at your door, your repair is performed correctly the first time. When you notice issues with your opener, contact the trusted service experts. Here at Action Garage Door, we take your problems seriously and we work to find you a reliable, affordable solution for your garage door repair.